It's cool research, but still research. Researchers at Michigan State University have developed a printable OLED circuit within a stretchable material, potentially paving the way for smart fabrics or truly foldable displays. Chuan Wang, assistant professor of electrical and computer engineering at MSU, is credited with the development of the OLED fabric, which flexes and stretches. If it can be commercialized, designers could take the techniology in several directions, including phones or tablets whose displays could be “stretched,” as well as the development of smart fabrics for banners, clothes, or other uses. Right now, Wang and his team have created the elastic material, the circuit, and the organic light-emitting diode, or OLED. The next step is to combine those elements into a working pixel, the foundation for a flexible display. That process will probably take one to two years. In the meantime, Wang said that he and his team are currently working on actual stretchable OLEDs and displays. “We will have another paper out soon” on that topic, he said in an email. Why this matters: It’s not really clear whether consumers have embraced curved TVs. But flexible displays are one of those technologies with a large number of potential uses: smartphones, tablets, wearables with a greater degree of flexibility. Of course, this is still in the research stage, and important questions about whether the tech can be manufactured at scale and cost-effectively still need to be answered. Nevertheless, its a cool concept. 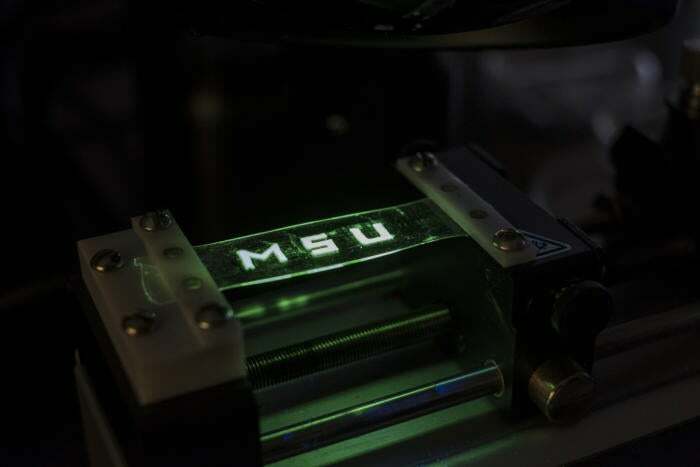 MSU engineer Chuan Wang and colleagues have created a stretchable light-emitting material that is produced entirely on an inkjet printer. In addition to simply being stretchable, Wang’s material can be printed with an ordinary inkjet printer, helping to keep manufacturing costs down. It’s a composite of several materials fabricated from nanomaterials and organic compounds, MSU said. The compounds are dissolved in solution to produce different electronic inks which can be placed inside of an inkjet printer and “printed” to form the stretchable circuits. It's an important development for a display industry that has long chased the idea of curved, bendable, and even foldable displays. Curved televisions and PC monitors are now being sold, but they are nevertheless static shapes; same goes for the curved display on Samsung’s Galaxy Edge smartphones. Displays that can actually be bent or deformed while playing back video may be the next step, similar to those demonstrated by Japan’s Semiconductor Energy Laboratory in 2014. The drawback of the Japan SEL’s demonstration, however, was that the display technology could only be moderately reshaped, much like ripples moving through water. Instead, smartphone makers appear to be more interested in next-generation “foldable” or “creaseable” displays, which can be radically transformed to save space. So far, those attemps have had mixed success. In 2010 Sony demonstrated a prototype that could be rolled around a pencil, though it apparently never panned out. Samsung’s display business also published a 2011 paper on folding displays. In addition, Samsung as well as Microsoft have published similar patents that call for smartphones built upon displays that could be folded back upon themselves. MSU’s technology appears to be a bit different. According to Wang, Samsung’s foldable OLED was still built upon inelastic materials, whereas his team’s work isn’t. 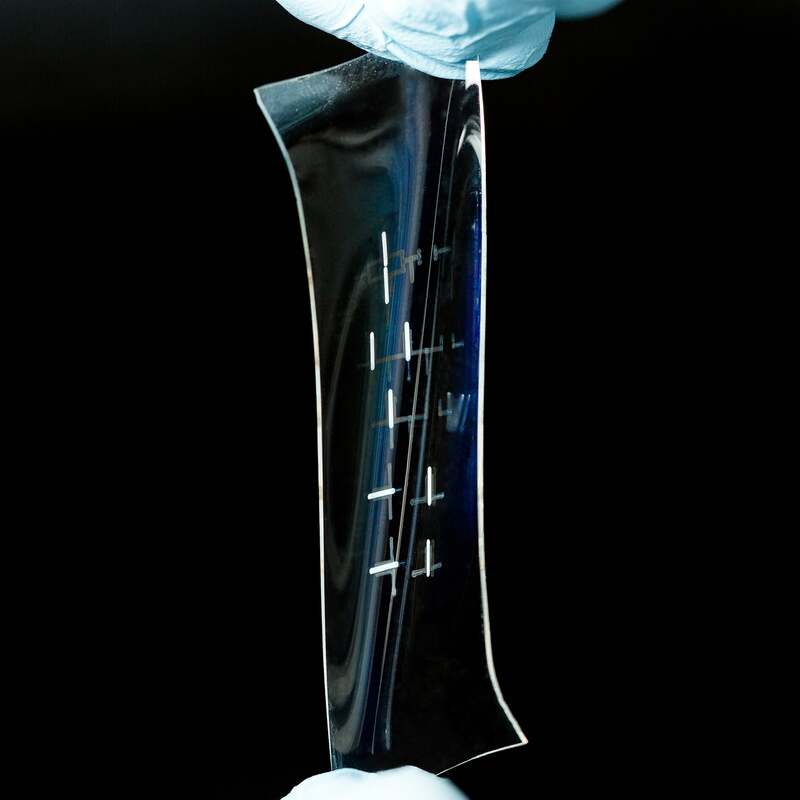 MSU and Wang said that his smart fabric, which is stretchable, could be folded and placed in a pocket without breaking. But the display itself could also be stretched if needed, taking the notion of flexible displays in an entirely new direction.